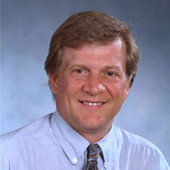 Charles F. Burant, M.D., Ph.D. is the Dr. Robert C. and Veronica Atkins Professor of Metabolism. Dr. Burant received his bachelor's degree from the University of Wisconsin and his graduate and medical degrees from the Medical University of South Carolina in Charleston. He completed his residency training at the University of California, San Francisco along with a fellowship in Endocrinology at the University of Chicago. He joined the faculty at the University of Michigan Medical Center in 1999. Dr. Burant's clinical interests are in the area of metabolic syndromes and management of Type II Diabetes. His research laboratory investigates the mechanisms of insulin resistance and utilizes animal models of diabetes to identify pathways important in understanding diabetes progression. Additionally, his lab also studies adult pancreatic progenitor cells and how they might be used to generate new insulin secreting beta-cells.